In January 2009 our outreach to Africa began with money raised to fund a Land Rover and its overland journey to Ghana. The trip aimed to support of a range of charities, including The Sabre Charitable Trust which supports and improves the infrastructure and standards of teaching in rural schools in southern Ghana. The focus of this support is on Kindergarten provision and is currently supported by Comic Relief. Mrs Warnock had tales to tell on her return from a month long journey through 11 countries and the final donation of the vehicle. This resulted in our initial partnership with Dwabor MA School, the location of the first Sabre revolutionary Kindergarten School, Sabre is still fulfilling its aim to build the schools, train staff and create a sustainable model for development. 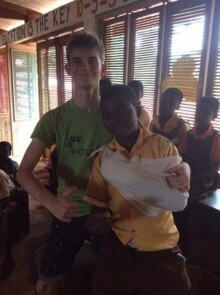 Weydon celebrated the partnership with an inspiring ‘Happy, Happy, Happy’ whole school Ghana Day followed by a ‘British Day’ hosted by the first school student expedition team during their visit to Dwabor in the summer of 2010. Students and staff worked alongside their Ghanaian buddies on a range of construction, renovation, community and educational projects. 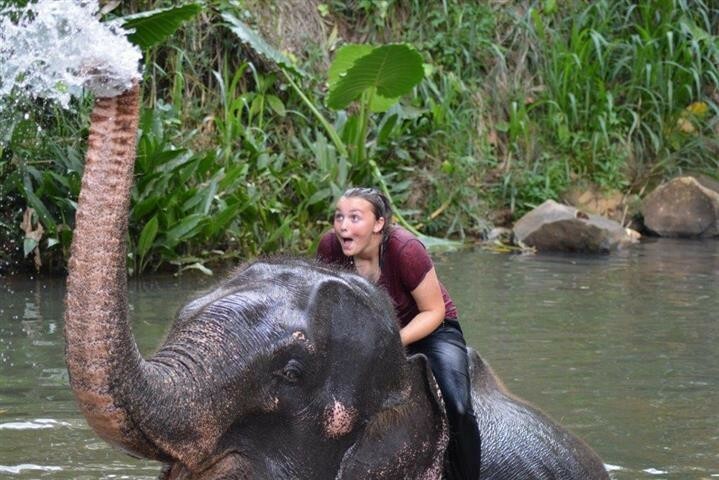 International expeditions are unique in that the staff and students commit to raising their own funds to cover their travel, living costs and projects completed in country. 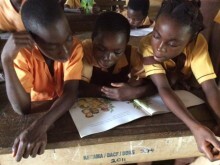 Ghanaian and UK staff and students work side by side sharing language, culture and a developing sense of global understanding and celebration. In 2012 and again in 2013, we were awarded reciprocal grants from the British Council and ASCL to facilitate staff exchanges from Weydon to Dwabor and then excitingly from Dwabor to Weydon. Staff and students were fascinated and excited in equal measure by the sharing of skills and ideas. Student teams have travelled to Dwabor every year with staff working alongside them to strengthen the partnership year on year. Watching the local communities grow closer and developing support for one another raised our concerns of the potential impact of so many students in this remote community so the big decision was taken to partner with a second community in the area; our relationship with Ayensudo Islamic School had begun. Just a 45 minute journey separates the two schools in Ghana and we are working to share resources and expertise in a three way partnership. Then a bomb hit the continent of Africa with the Ebola crisis. Although Ghana was used as the base for the World Health Organisation and the world’s press, we were unsure how the crisis would develop and to be sure of the safety of the student teams planned for 2015 we branched out yet again and after recce visits and careful planning our third partnership was launched – with Tzu Chi School in Hambantota, Sri Lanka! This community had been devastated by the tsunami of 2004 and we made contact with The Janoda Foundation who has worked tirelessly to support recovery and development. Tzu Chi is an inspiring building but with few facilities within it! 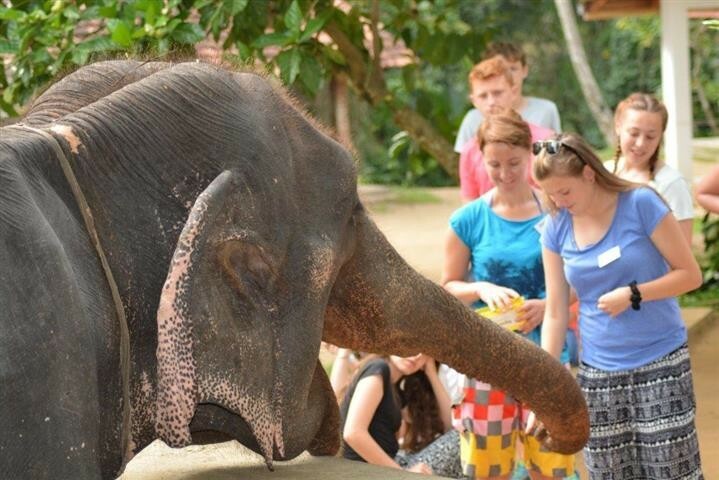 A new and exciting challenge then added to by unexpected contact from an ex student from Weydon working with volunteers at the Millennium Elephant Foundation in Kegalle, only an hour’s journey from the airport in Colombo. Our two-centred support was begun involving an amazing train journey between the two areas travelling through the beautiful tea plantations of the central hill country of Sri Lanka. I cannot impress upon our Farnham based community the impact of these partnerships on the individuals who travel and the whole school family. We collect and carry books to support reading and English; we train one another in basic first aid; we work side by side to improve the provision and understanding of group work, learning through play and less didactic teaching styles; we paint murals and help skilled craftsmen to construct playgrounds as well as a wealth of other activities and visits. The locals help us to understand the value of community and family and a less commercial lifestyle. Together we are making journeys of discovery about ourselves and others; different cultures and beliefs but maybe most importantly how similar we all are and the values that we hold dear. Together, as we say, we can make a difference and learn just a little more about ourselves and our understanding of this ever more complex world. We hope to help all the staff and the students within our partnerships to think about our global responsibility and look at the world with open eyes and open hearts and minds to match.